Choosing artworks from the Woodson Art Museum’s permanent collection to amplify the themes of Cut Up/Cut Out, the current temporary exhibition, was thoroughly enjoyable. Sometimes making a connection between temporary exhibition themes and Museum collection artwork is difficult. 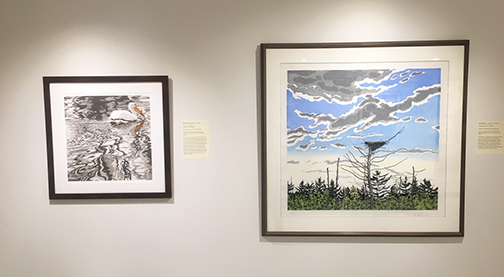 In this instance, to complement Cut Up/Cut Out, I looked to the collection’s extensive holdings of woodcuts and linocuts and the processes used to make those prints. To create an original woodcut print, an artist carves a design into a block of wood, inks the block, and then prints it on a piece of paper. A centuries-old technique, woodcutting originated in China. Woodcuts featuring several colors typically require more than one block – usually one block per color. In some instances, more than one color can be applied to a block. The success of a complex, multicolored woodcut relies on the precise alignment of the blocks when each is printed; an L-shaped piece of wood is used as a jig to ensure alignment. Creating a linocut requires a similar printmaking technique, using a sheet of linoleum – sometimes mounted on a wooden block. A design is cut into the linoleum surface with a sharp knife or a V-shaped chisel. The raised or uncarved areas represent a reversed, or mirror, image of the elements to be printed. The linoleum is inked with a roller and then pressed onto paper or fabric, either by hand or using a printing press. Without the directional cutting limitations of wood grain, linoleum makes it easier to obtain some artistic effects. Linocuts do not have the angular, grainy characteristics of woodcuts. The woodcuts and linocuts included in The Cutting Edge were created by Walter Inglis Anderson, S.V. Medaris, Ron Meier, Andrea Rich, Neil Welliver, and Sherrie York. All feature exciting and intricate designs that brighten the Museum classroom where program participants and visiting students are sure to be inspired while working on hands-on art projects this spring. 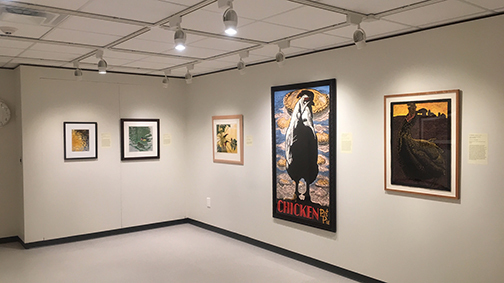 Visit the Woodson Art Museum soon to experience the connections between The Cutting Edge and Cut Up/Cut Out, on view through June 2, and discover what inspires you.